The 2018 BCMC show runs from October 23-26 in Milwaukee, Wisconsin. On the show floor, component manufacturers (CMs) will have an opportunity to see all of the latest innovations available to help them design, build, and deliver their products with greater efficiency and at an even higher quality. All of the exhibitors there want to help solve the pain points CMs face every day. If CMs put their supplier hat on and hosted the exact same show for builders, general contractors, lumberyards, and framers, what would that theoretical show floor look like? Obviously, they’d see roof trusses of every size and shape: long span trusses to highlight the way they facilitate flexible floor plans, scissors trusses that make vaulted ceilings a breeze, attic trusses to allow for the cost-effective addition of rooms or storage space, and raised heels to allow for easier compliance with the energy code. Ultimately, they’d see the many ways roof trusses allow for a much quicker and safer installation process. They’d also see floor trusses of every depth and length. Again, the long spans would showcase the versatility they allow building designers. The open webs and chase openings provide for easier installation of mechanical, plumbing, and electrical infrastructure, saving time and reducing headaches on the jobsite. They might also see floor truss panels, which would decrease jobsite installation times even more. They’d likely see a smattering of wall panels too. These panels would range all the way from componentized rough openings that framers can work around in the field to fully insulated and sheathed panels with pre-installed doors and windows. The various wall panel complexity on display would vary from replicating exactly what is being built in the field to highly efficient ‘perfect walls’ that arrive at the jobsite ready to provide the most energy-efficient performance available from today’s materials. Throughout, they’d also see booths on the show floor promoting estimating and take-offs, as well as design and engineering services. Every booth would offer attendees a solution to their most common pain points, whether it’s a lack of jobsite labor, a desire to decrease field errors/call-backs, or a motivation to seize upon the public’s growing demand for a more energy efficient building envelope. 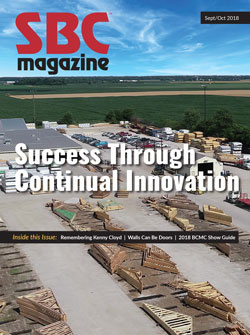 In this issue, Mike Rehkemper, CEO of Rehkemper & Son, shares his company’s philosophy on meeting their customers’ needs and how his company constantly seeks ways to stay ahead of the curve to offer more solutions than their competition (see page 12 of the digital edition). Their company is a prime example of what every CM in the country could bring to the table in addressing the problems facing the building construction industry. As you walk the BCMC show floor at the end of October, think about all the ways in which exhibitors are promoting their goods and services. Is there a lesson inside BCMC on how you could promote all the benefits your products and services offer to your customers? If you want even more ideas on how to promote components to a wide variety of audiences, definitely check out bestwaytoframe.com and SBCA’s new truss plant tour page as well!